This navy blue hat is adjustable in size for $25 each. 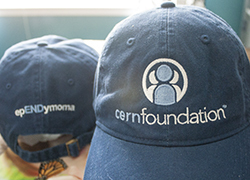 The front includes the CERN Foundation logo in white and light blue stitching and the back says epENDymoma. Order and wear yours with pride to help create awareness of this rare disease! Let's END this disease!